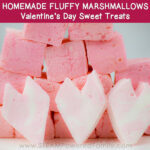 Make sweet, fluffy Valentine’s Day Treats with this easy and fun Homemade Marshmallows recipe. Explore the science behind marshmallows and why they are so soft, fluffy and tasty. Give yours a special Valentine’s twist by making your homemade marshmallows pink and heart shaped. 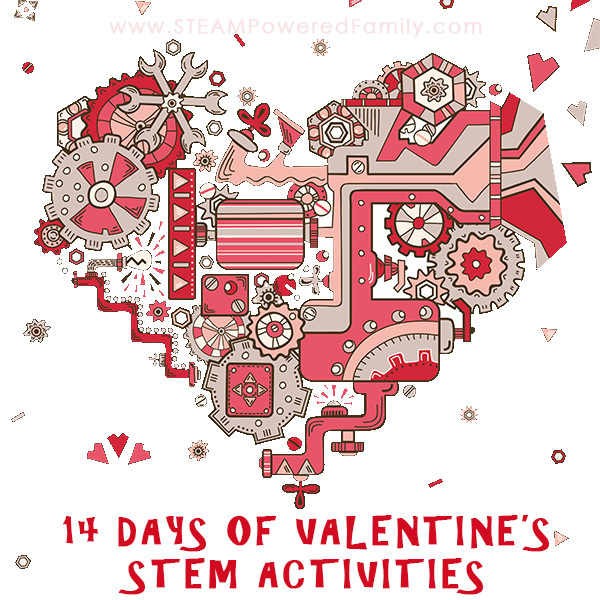 Perfect for those you love on Valentine’s Day! We’ve had a lot of fun in the past with Marshmallow Science, where we explore why Marshmallows expand when heated and also when we made edible Marshmallow Play Dough. It was inevitable that at some point the kids would start to wonder how we can make our own Marshmallows, especially after our recent explorations into Candy Science. So here it is! 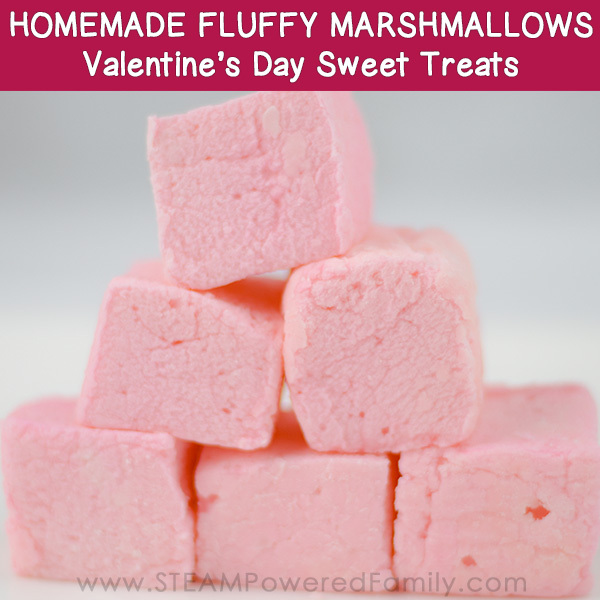 How to make your very own Marshmallows and to make things interesting we made ours as special Valentine’s Day Treats. The first step is to mix ¼ cup icing sugar and ¼ cup corn flour in a small bowl for dusting the pan and marshmallows as they can get sticky. Work it through the sieve to create light dusting as needed. Put the sugar, water and corn syrup into the clean saucepan. There is no need to stir, but if you must stir, don’t stir once bubbles start forming. Over medium heat cook until the syrup starts to boil. Turn the heat down to create a medium/slow bubble. Leave it alone – no stirring. Add the candy thermometer to the pot and let the mixture heat until it reaches a 121 C or 250 F. This is the firm ball stage in ‘candy speak’. While it is heating, butter and liberally dust the pan with the icing sugar/corn flour mix. Put the gelatin into a small bowl and add ½ cup water, mix. Let it stand while you prepare the meringue in the next step. Put the egg whites and cream of tartar into an electric mixer and beat on high until the egg whites form peaks. Turn down the speed and gradually add the sugar. Resume high speed and keep beating until you get firm peaks in the meringue. Combine all the elements and make Homemade Marshmallows! When the syrup has reached 121 C, remove from the heat and carefully pour the gelatin mixture into the syrup. Be warned it will bubble so be careful. Stir until the gelatin is incorporated into the syrup. Now turn down the electric mixer to slow speed and slowly add the syrup to the egg whites. When they are combined, turn up the speed and allow mixture to cool down while it continues to beat. Don’t beat until the mix is cold just until it starts to thicken and form ribbon patterns as it beats the mixture. This will take about 5 minutes. Add flavoring and color at this time. We used red food colouring to get a pink colour for our hearts. Add food colouring early on during the last 5 minutes in the mixer to get a uniform colour, or wait until almost the end of the 5 minute mixer time to get striations in your colours. When your mixture reaches the ribbon stage pour into the prepared pan and leave to set for 2 hours. After 2 hours of setting, cut with a large knife or with a cookie cutter. Liberally dusting the knife and the cutter as you work to prevent sticking. 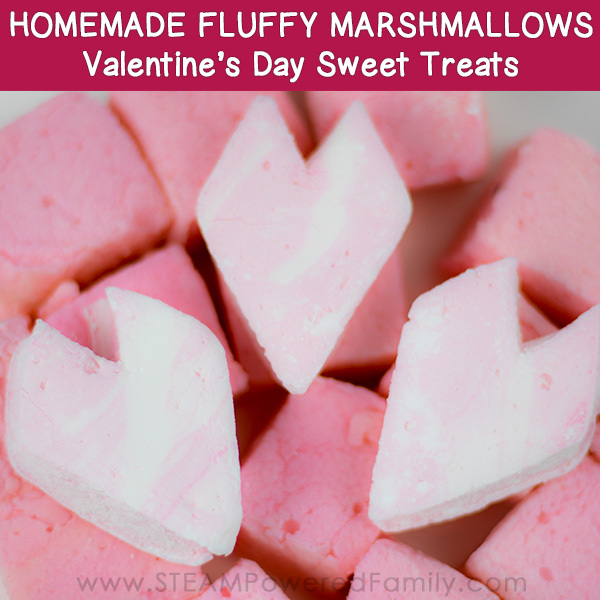 MARSHMALLOW SCIENCE – How do they get so fluffy and tasty? Marshmallow is a foam made with air bubbles trapped in sugar which has been stabilized by protein. The sugar is added to the recipe as a syrup in Marshmallow recipes. We know from our sucrose science that a syrup is made from pure sucrose (granulated sugar) and water. 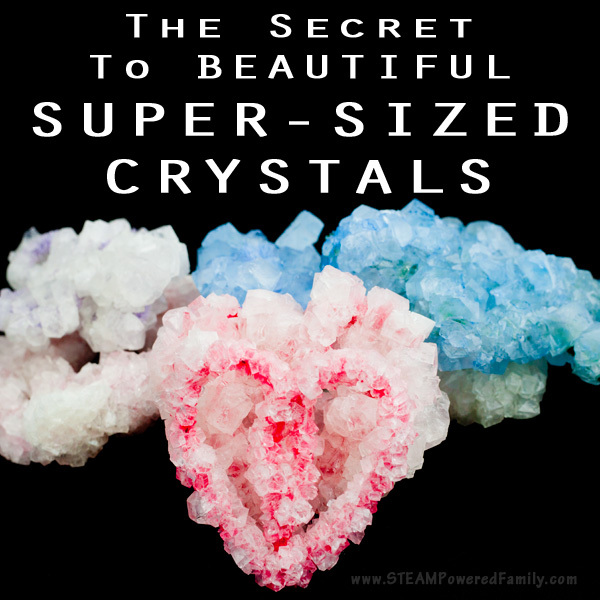 We also know that the sugar syrup will recrystallize as the water cools. We know that this will give our finished candy a gritty feel so to prevent these large crystals from forming, we add the corn syrup. The result is we get a smoother syrup. The next thing we have to consider is the concentration of the syrup; i.e. : how much sucrose is left in the syrup mixture. You will remember that the concentration can be accurately assessed by the temperature of the syrup. At 121 C the water has evaporated until the syrup is a 92 percent concentration. This will give us the correct sugar content to make our marshmallow. 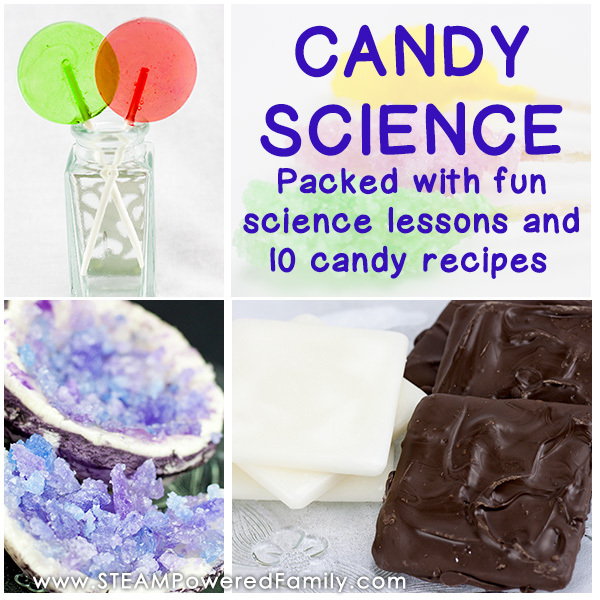 Remember, for more on the science of sugar and candy making, check out our comprehensive resource. The egg whites are a protein that, when whipped, will incorporate air into its mass. This forms the airy base for the marshmallow. The cream of tartar stabilizes the egg whites to encourage the air bubbles to form. However, the egg white isn’t strong enough to hold up against the syrup and the egg whites will lose the air if you put the syrup directly into the meringue. You can counteract this by adding gelatin and this will strengthen the protein structure allowing the air bubbles to remain suspended in the egg white. 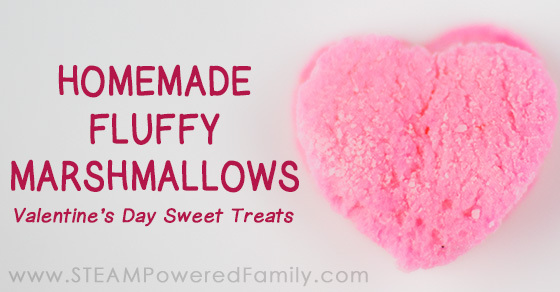 All of this results in the fluffy, sweet, yummy treats we know as Marshmallows! Explore the science behind marshmallows and why they are so soft, fluffy and tasty. Then enjoy the tasty result of your science experiment in the kitchen! Make something amazing with your new marshmallows with this delicious Ambrosia Salad from Salty Side Dish, so good!